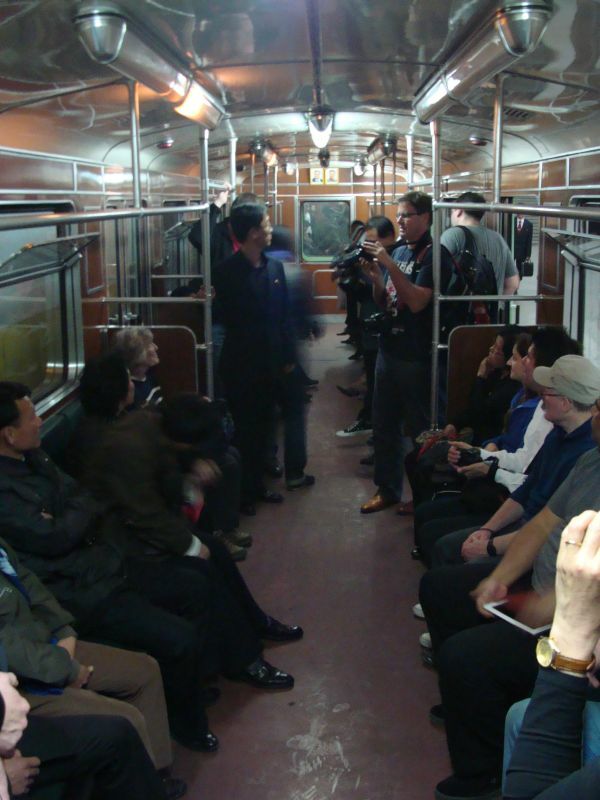 All travelers, except for US citizens, have the option to depart the country by train. 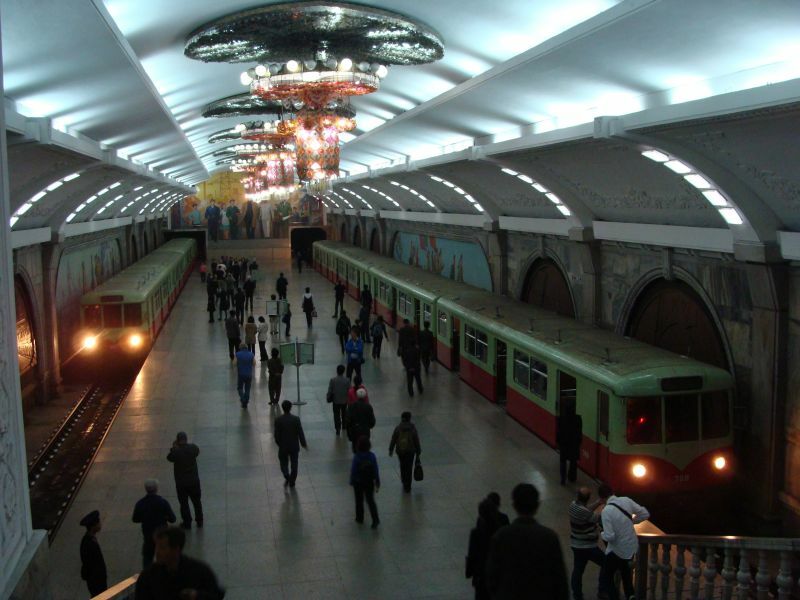 We choose to do this to have the chance to see more DPRK. We were briefed not to take photos of railway stations (these being considered military assets) but there was nobody to enforce. 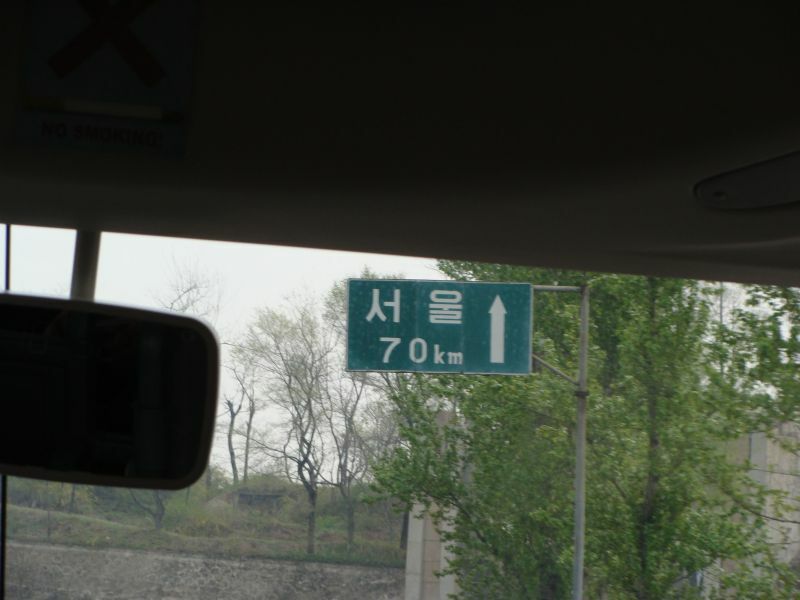 The trip was supposed to take 23 hours, out of which almost 3 hours were to be spend at the border crossing. 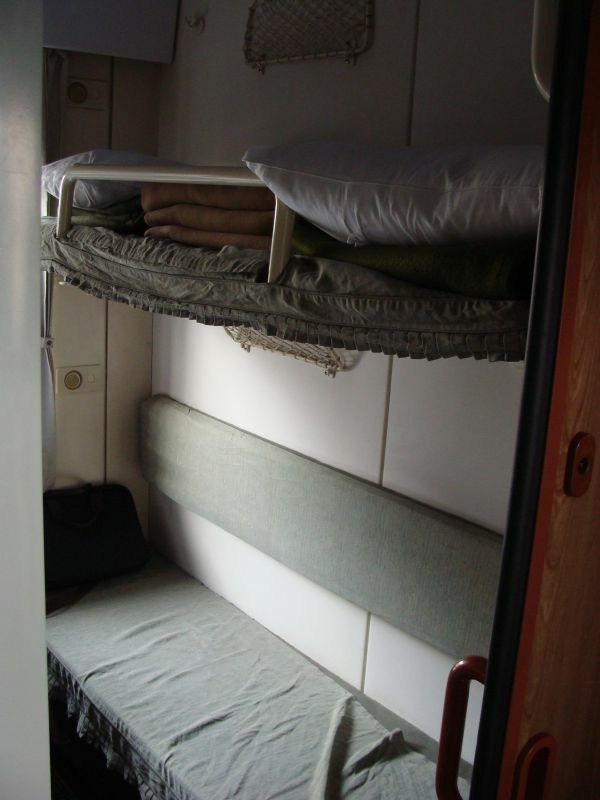 This was our sleeping compartment, with 4 bunks. 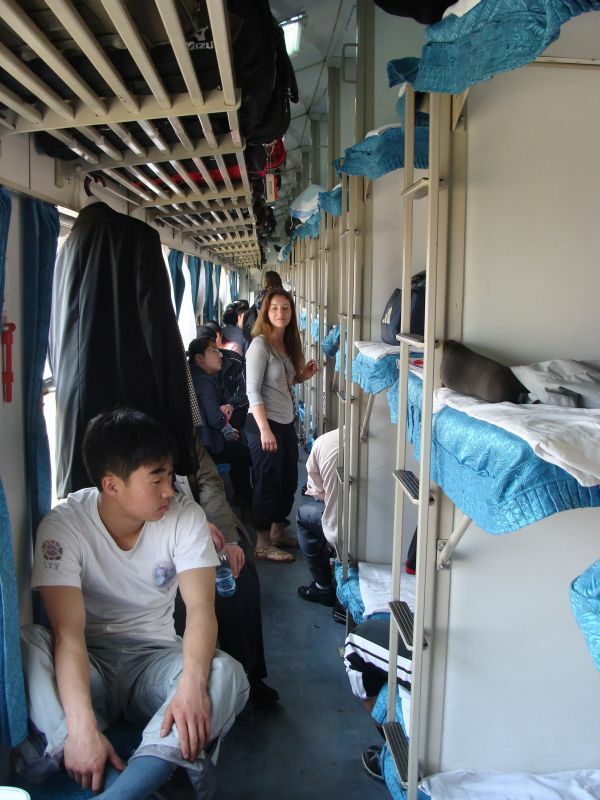 This is the hard sleeper car (called like this probably because it is hard to fell asleep and even harder to remain asleep) where those of us who choose to get off train in Dandong (first station in China) were booked. 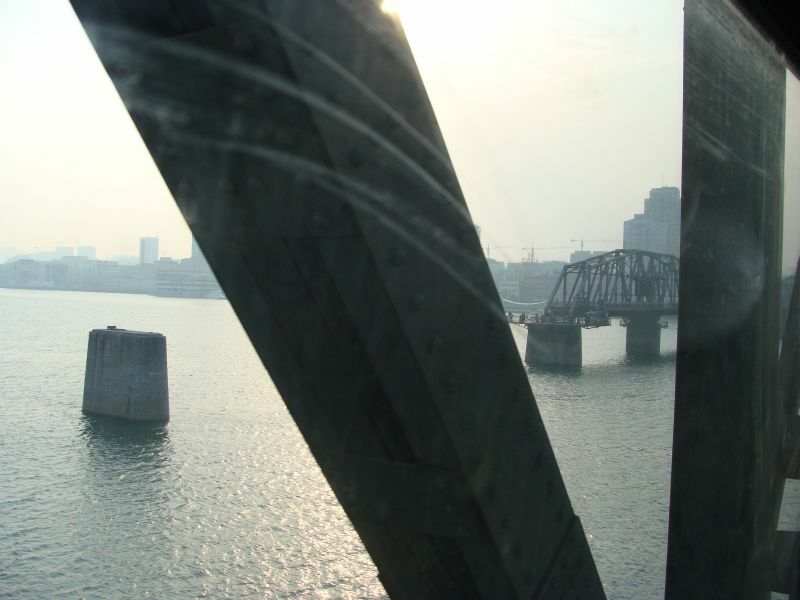 Crossing the Yalu river into China. 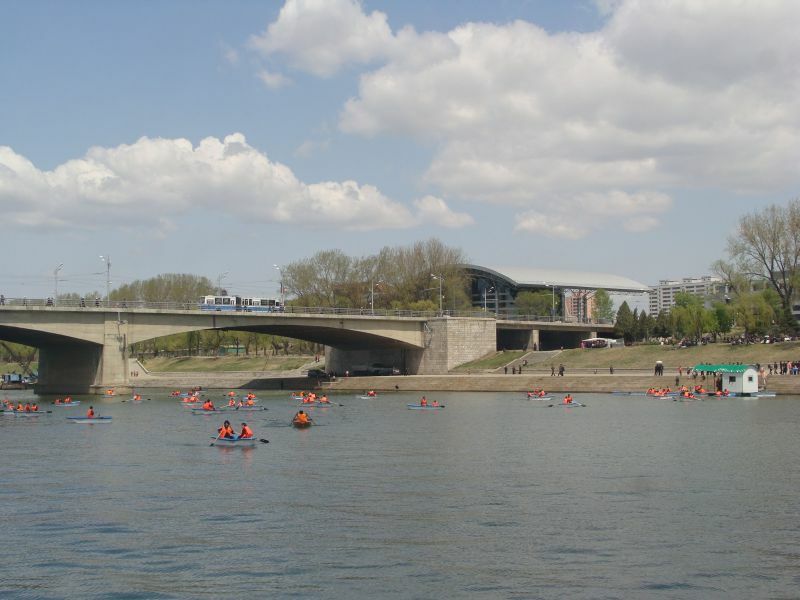 Note the old bridge, damaged during 1950s war, never rebuilt. 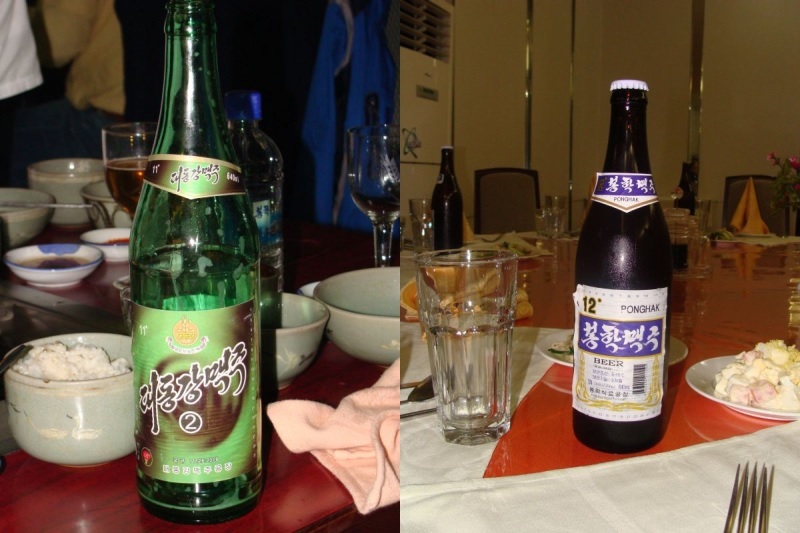 The primary reason we went to DPRK is the country’s uniqueness. Having been visited Cuba in 2008, this was the last Cold War dinosaur to experience. We found strong resemblance with 1989 Romania. 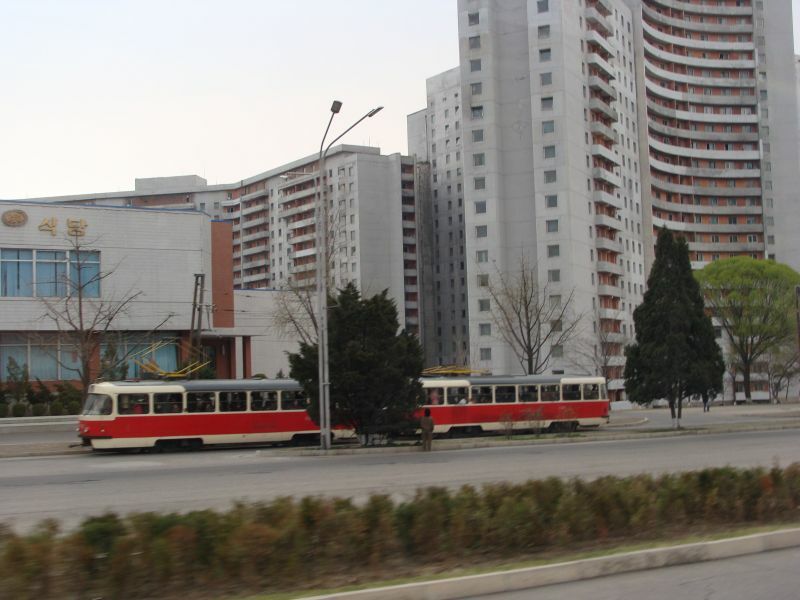 Although I might be wrong, I think 2013 DPRK is around 25% poorer, 25% stricter but also 25% cleaner and neater than Romania was 25 years ago. 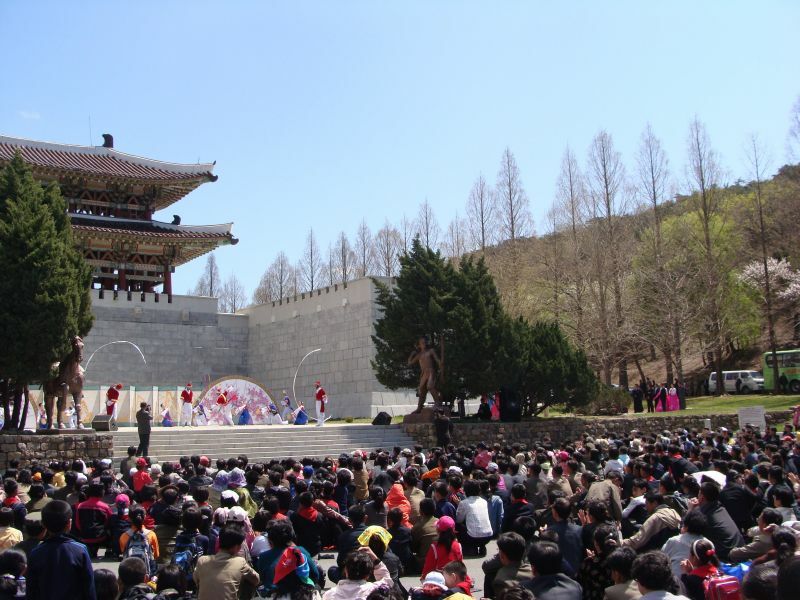 Furthermore, the Korean staff (Mr Lee, Miss Hann, Mr Hann) performed beyond expectation. 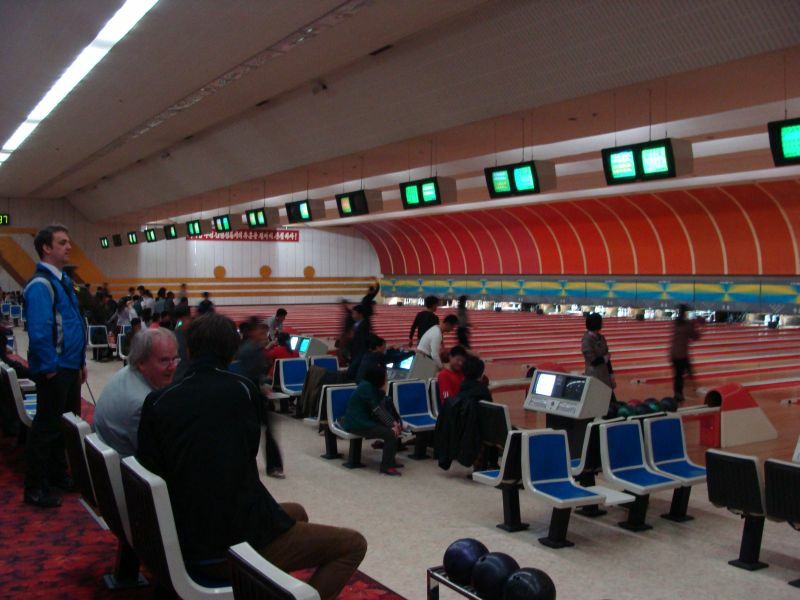 They struggled to maintain the balance between being friendly but also follow the rules imposed. 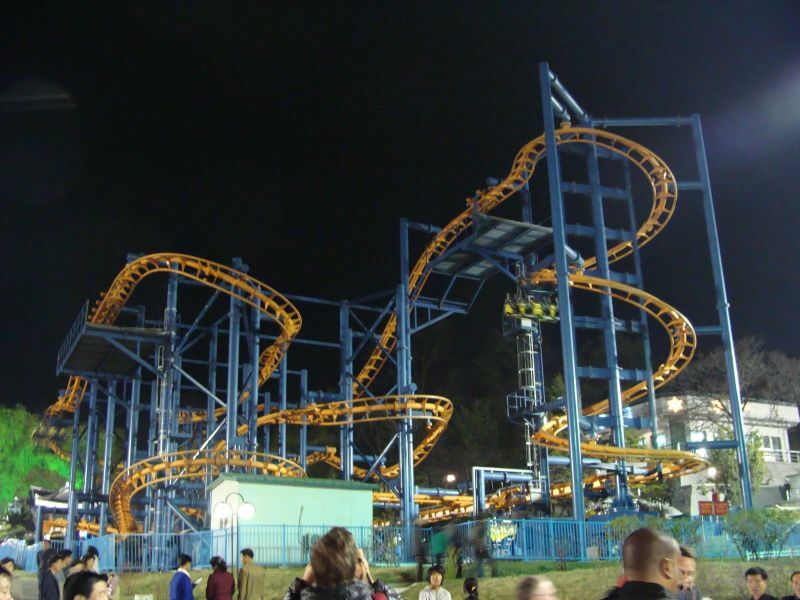 The schedule was well balanced, entertaining and exciting. 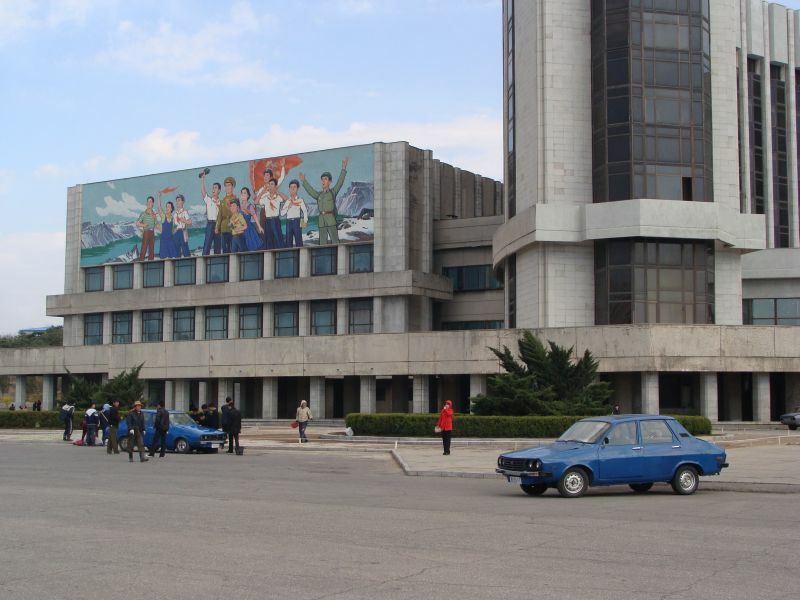 We would like to go back to DPRK some day not for the adventure or the incredible places, but because we felt good overall. 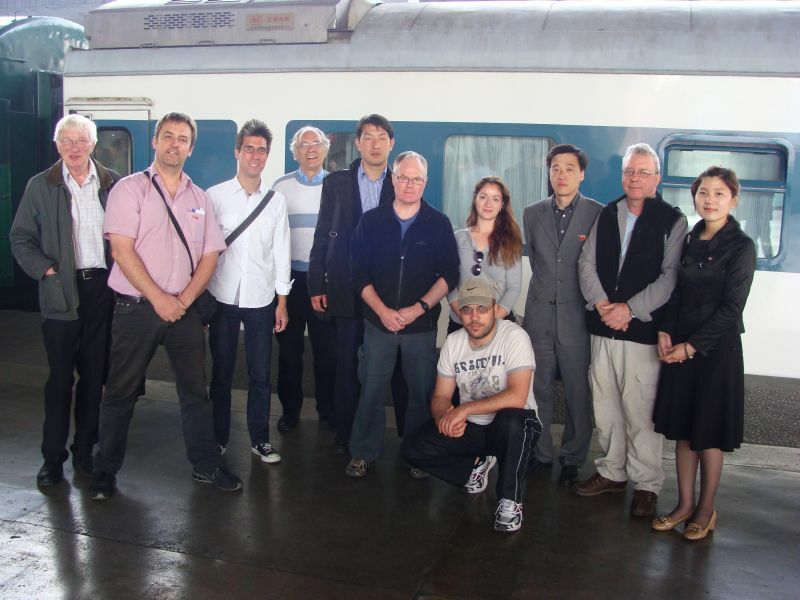 Last but not least, thanks to our Koryo tours staff, Hannah and Sarah, for making such unique experience possible. 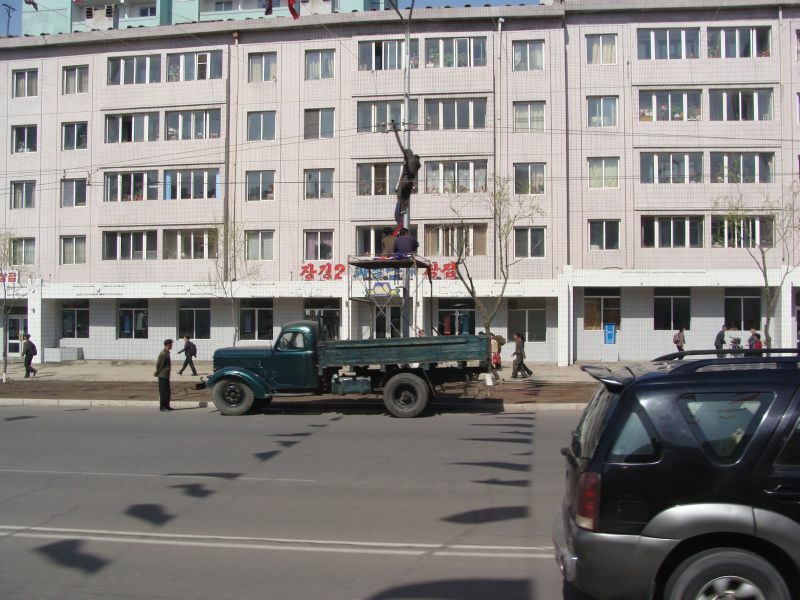 There was a mix of old an new on the streets of DPRK. Side by side were 1950s GAZ, 1980s Mercedes-Benz, 2000s Ladas and 2010 Audis. Also present many rather new Chinese cars that I was unable to recognize. Trams were vintage Czechoslovak Tatras, some modernized. 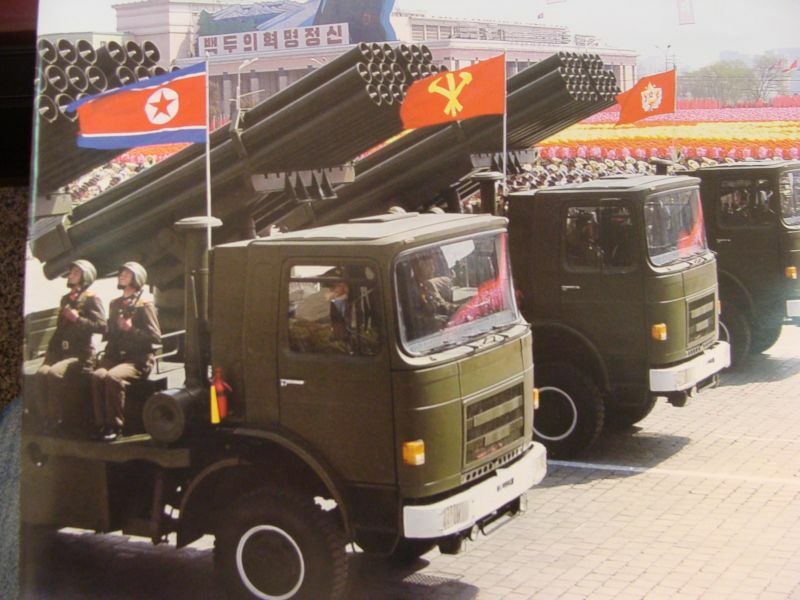 I was able to find these Romanian made, Katyusha converted ROMAN trucks in a recent magazine. 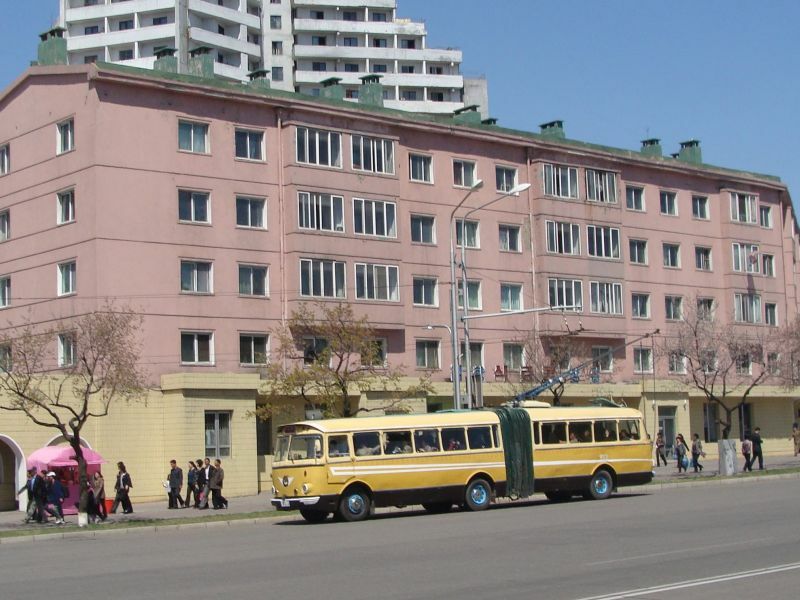 Plenty of 1980s Dacia still in use, as taxis and for teaching. 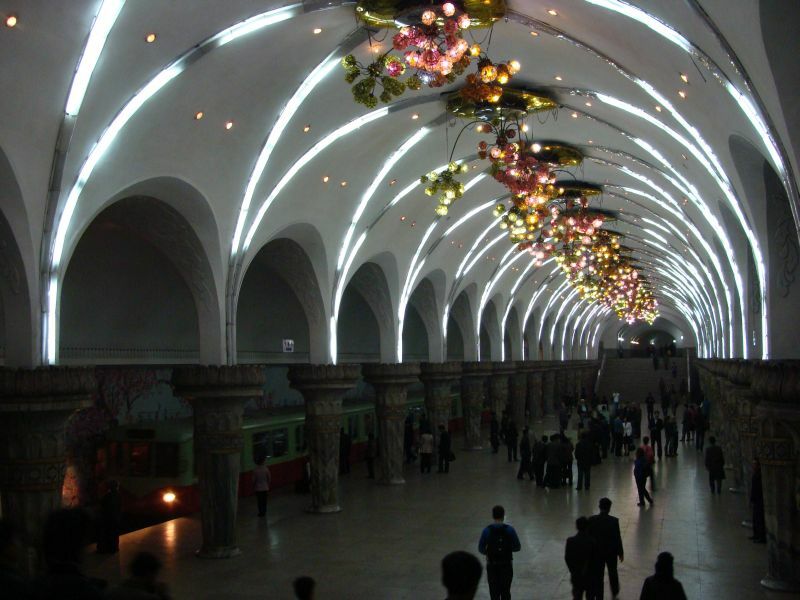 But the most beautiful is the Pyongyang metro. Inspired in design from the one in Moscow, it has two lines and we were allowed to ride 4 stations in a former East Berlin S-Bahn train. 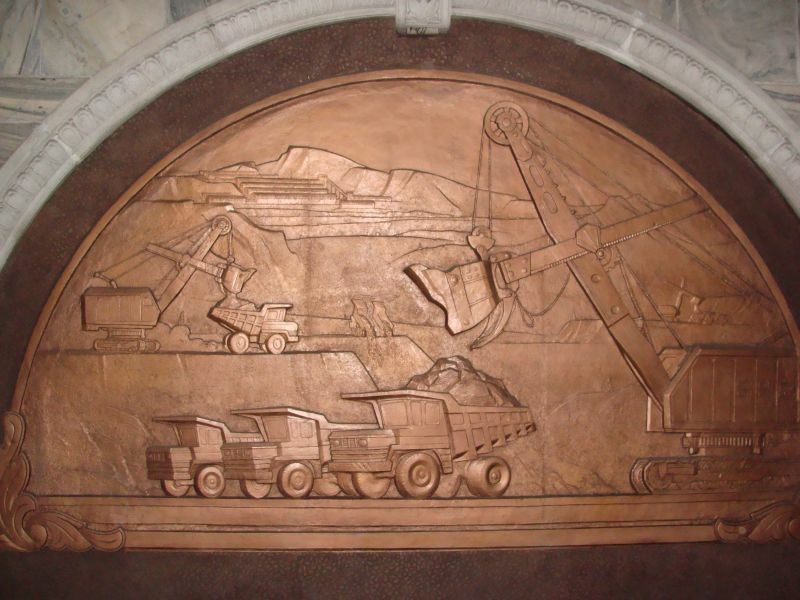 Impressive murals depicting revolutionary scenes and sculptures about the industry, agriculture, military and so on. 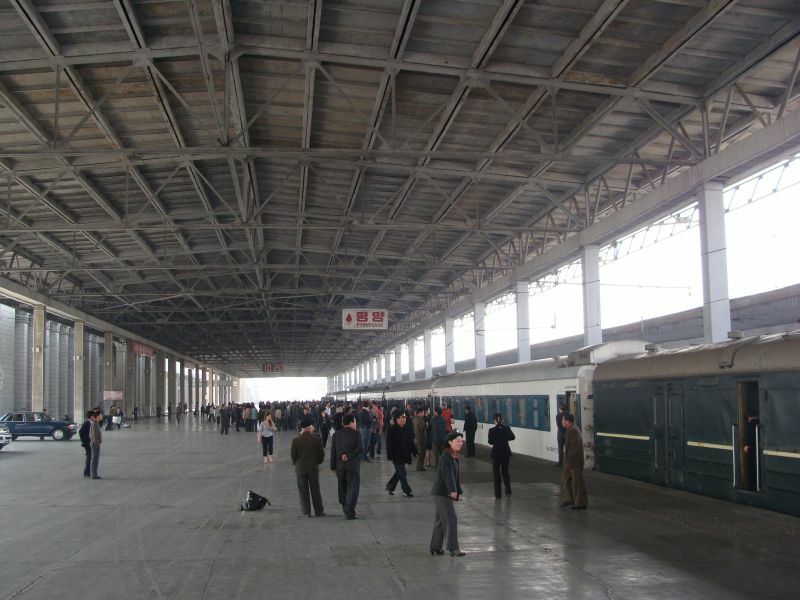 Note in the middle of the platform there is displayed the Worker’s Party newspaper, for consultation by the travelers. 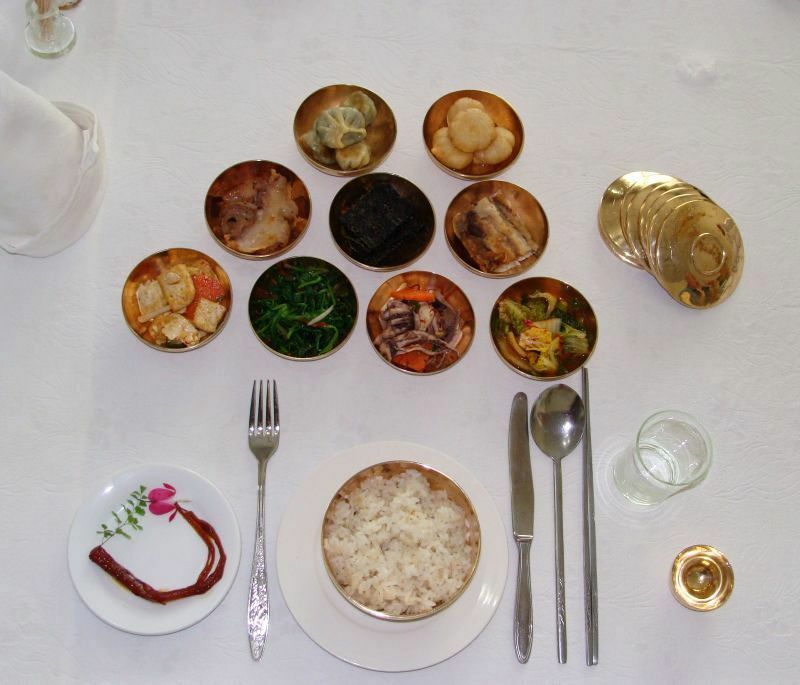 We enjoy Korean food and eat it regularly. 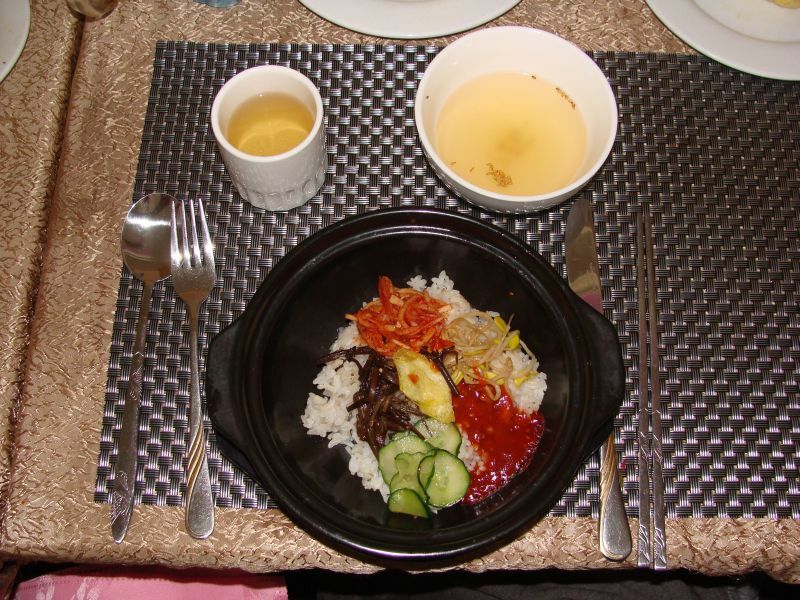 So we were eager to see how Korean food made in Korea tastes like. We had a very pleasant experience. 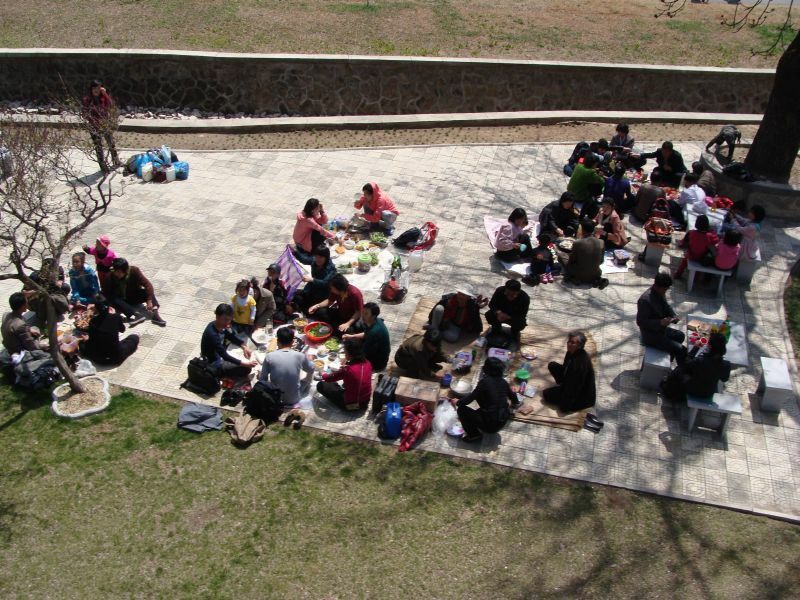 Except for the breakfast, they never served us same dish twice, always coming with nice settings and exciting locations to enjoy lunch and dinner. 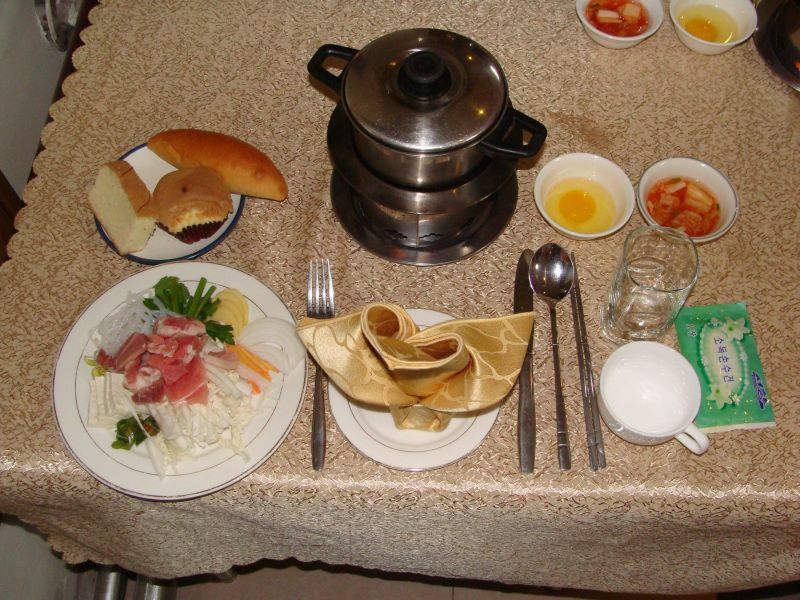 The only downsides are that they served way too much eggs (we ate probably as much eggs in 1 week as we normally eat in 2 months) and that the staple (rice/noodle/etc) was always served last, after we had finished the meat and vegetables. Explanation is the custom is to serve staple last to avoid leaving impression that you want to get your guests full on cheap food. I believe the food we got was not generally available to the local population, but I can not be sure about that. 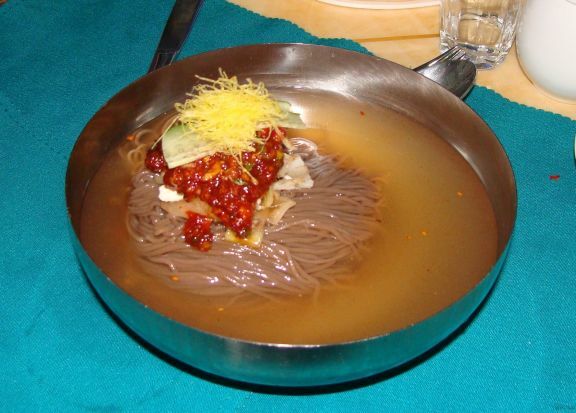 This is Pyongyang style cold noodle soup. 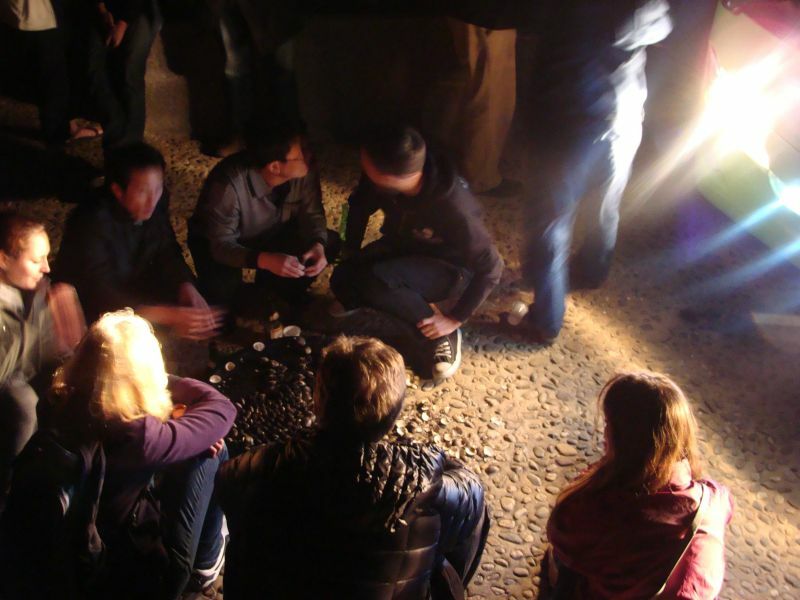 Grilling clams in the dark using the bus’ headlamps for lighting while drinking some locally produced spirits. Improperly said grilled, as they got cooked by pouring gasoline on top of them and then setting them on fire. Taste very good except from the sand that might have gotten inside. 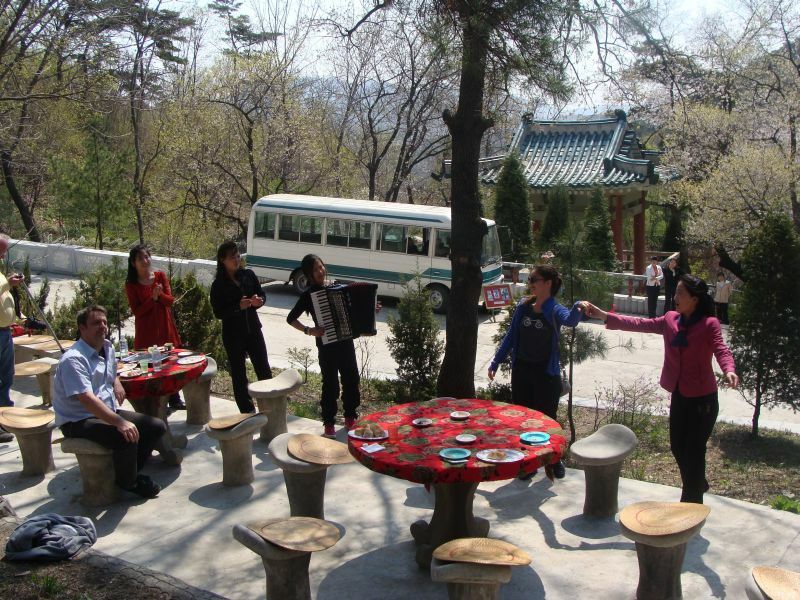 Picnic followed by short artistic program performed by waitresses. And the best of the best, the bulgogi. 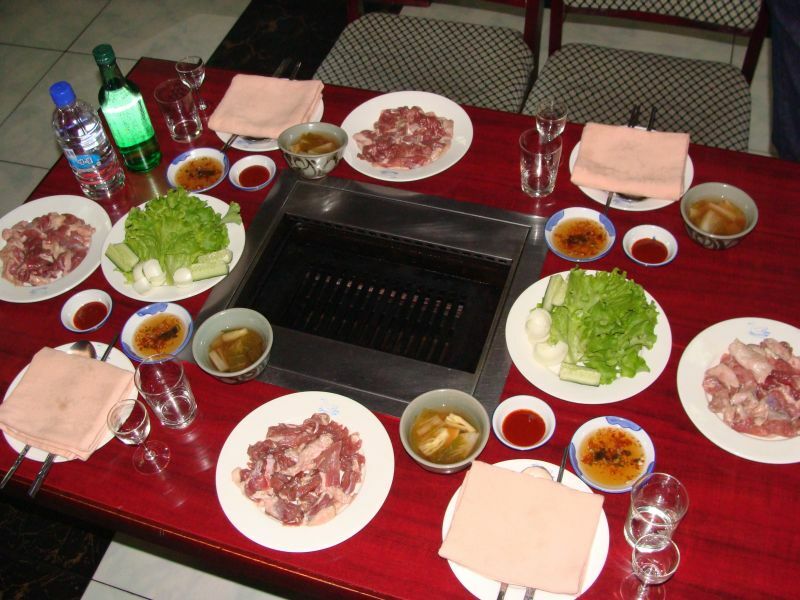 Guests cook their meat at the table. 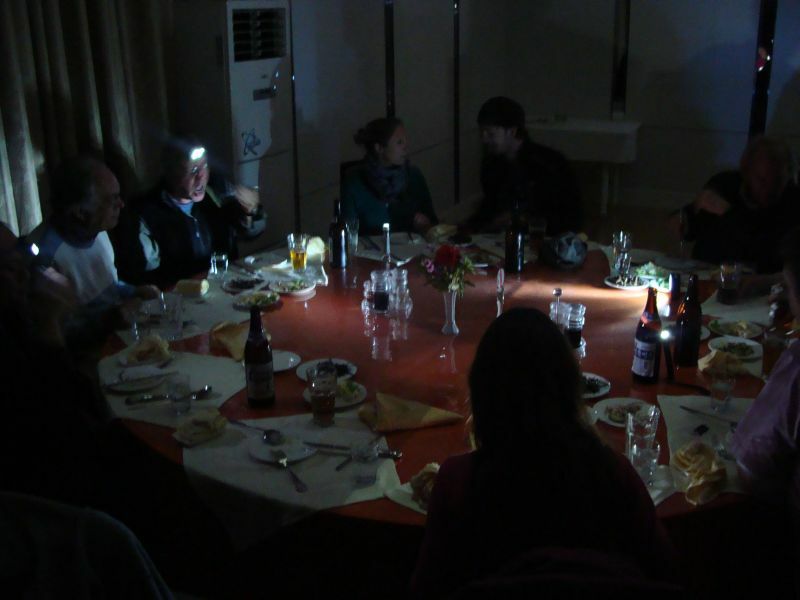 While uncommon in Pyongyang, blackouts might be encountered in the countryside. Flashlights highly recommended. Two brands of local bottled beer and a small brewery we visited. 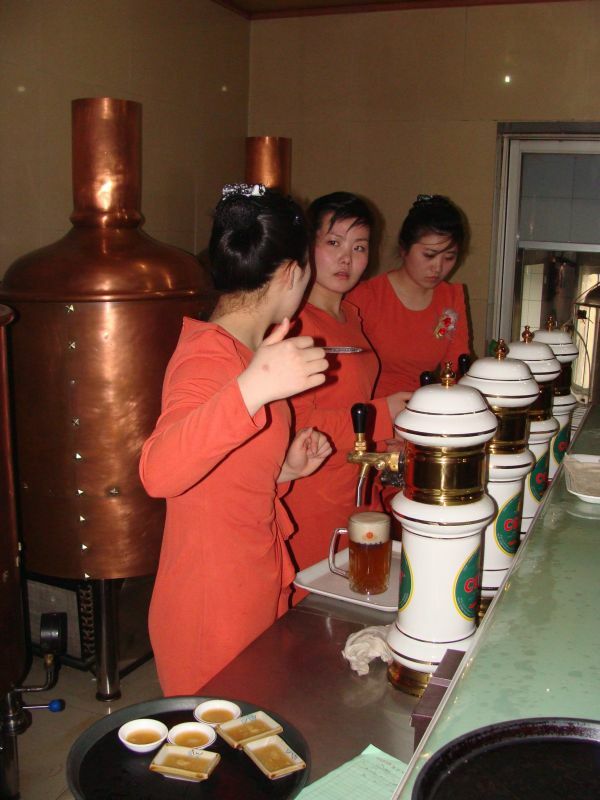 Beer is cheap and good in DPRK! 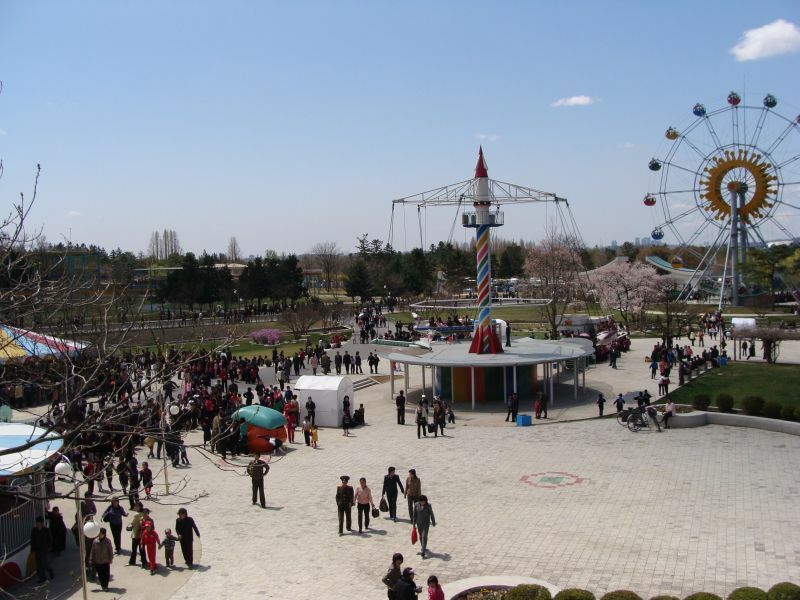 Almost every day there was some leisure time allowed, either picnic, games, sports (such as running for 5km in Pyongyang) and amusement parks. 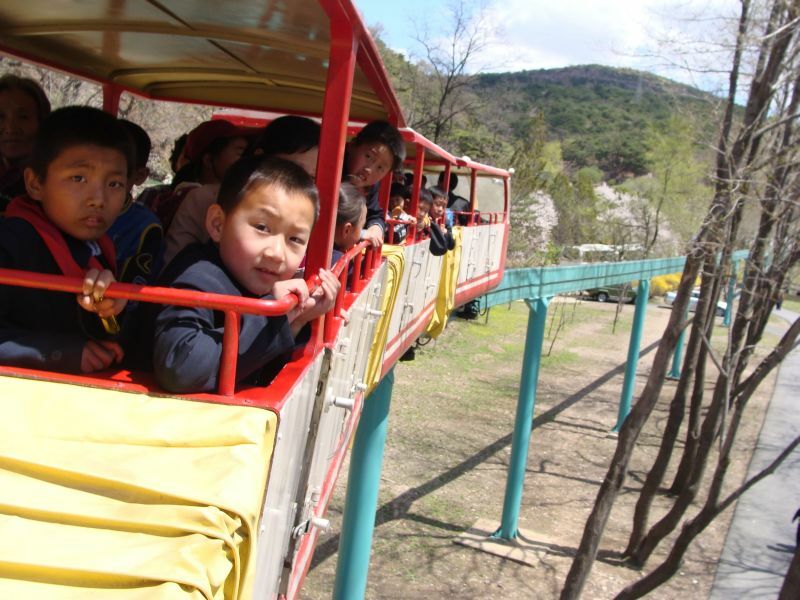 During most of these activities we were allowed to mingle freely with the locals, something that was not usually permitted. 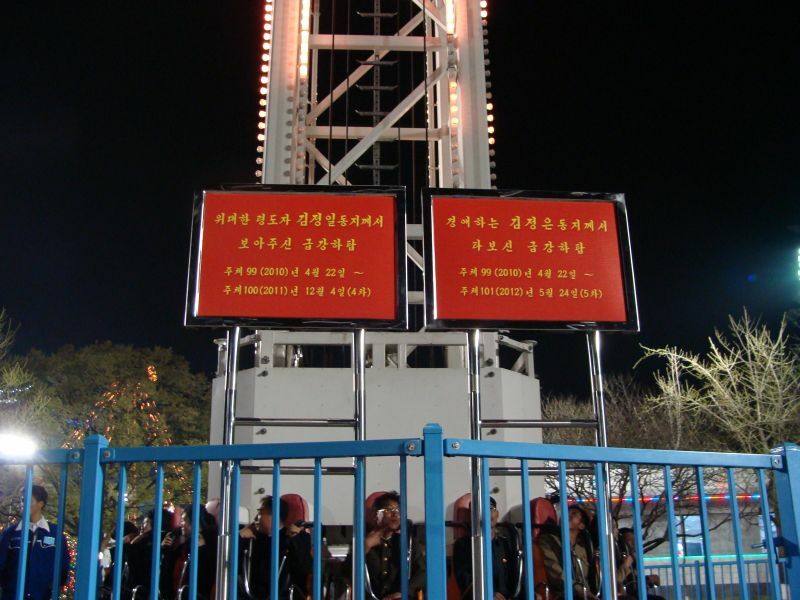 This is a plaque commemorating the day when Kim Il-sung and Kim Jong-il arrived at this amusement park and experienced this particular ride. There was a pair of plaques like this affixed in front of each ride. 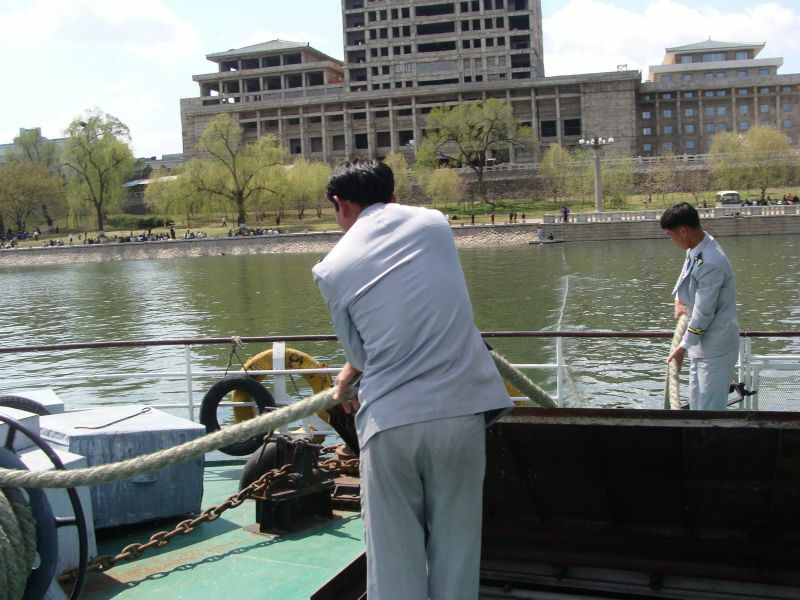 One day the lunch was served aboard a small ship on the river in Pyongyang. At some point something happened and the ship had to be brought to the shore using the capstan. Again things went wrong when the crew managed to ground the ship, so a rescue operation was organized. 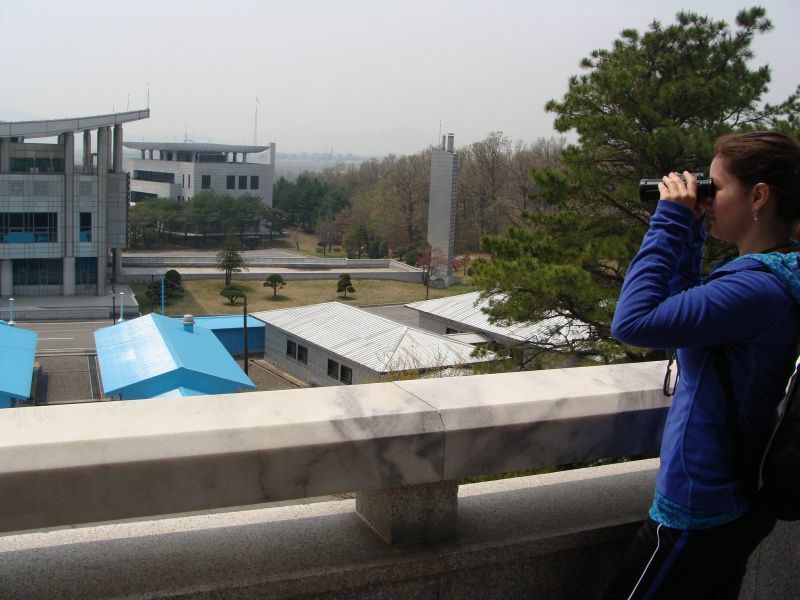 Our tour included a visit to the DMZ. 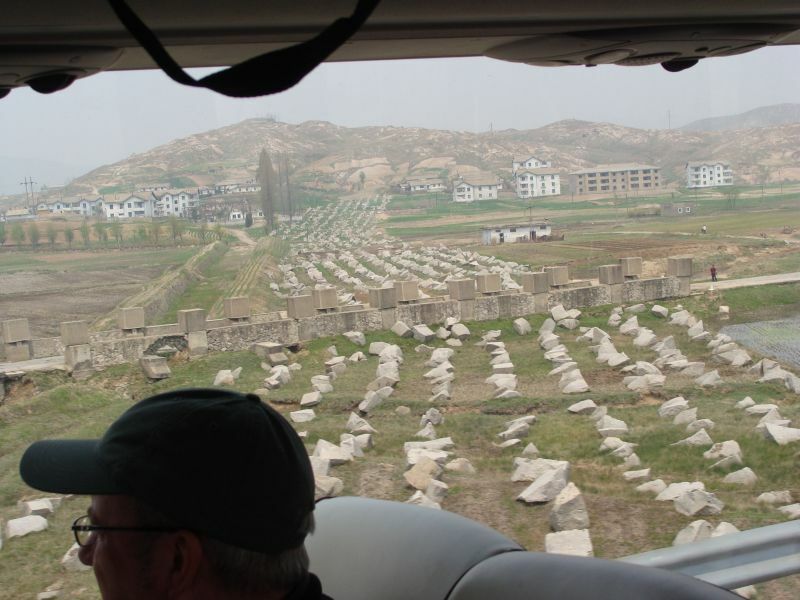 As we were driving South I was able to see several groups of defensive obstacles. 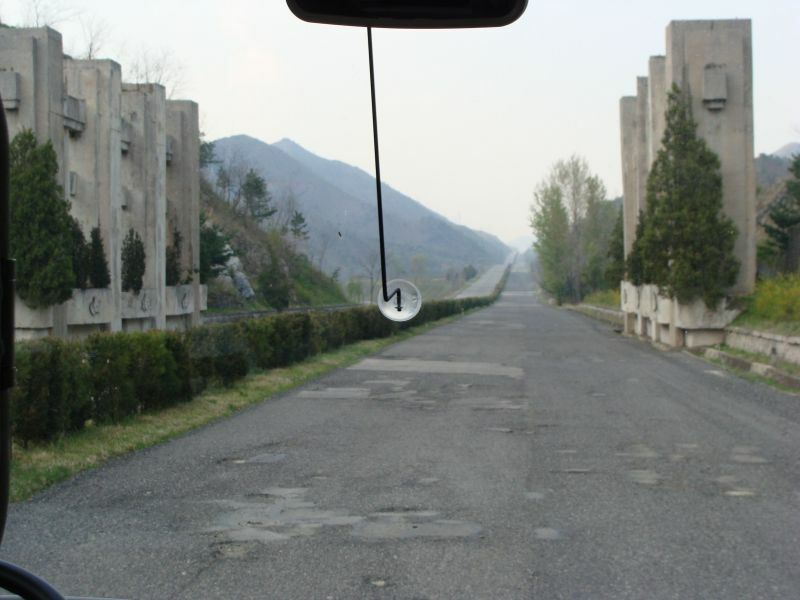 The road itself had a few layers of concrete structures on the side, built in such a way to collapse (when pushed) on the road to create a road block, in case of an invasion from the South. 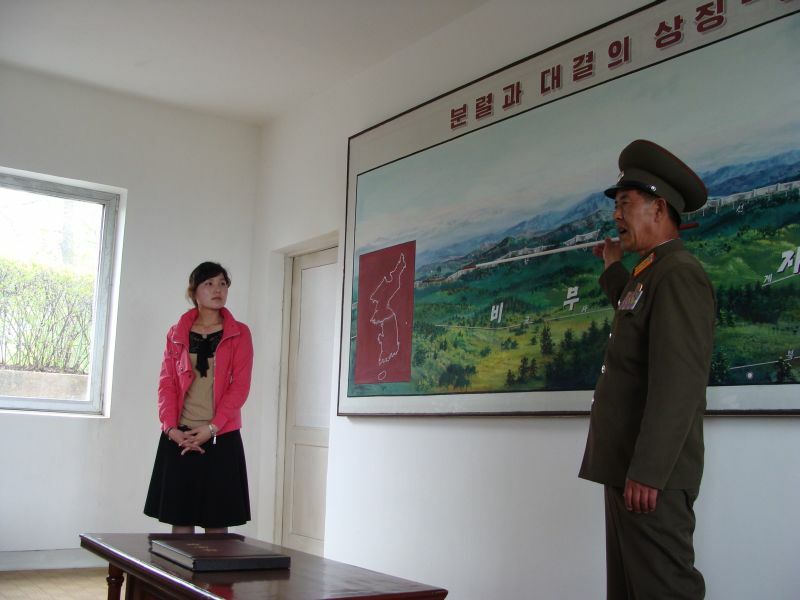 Before entering the DMZ we received a briefing from the military staff. 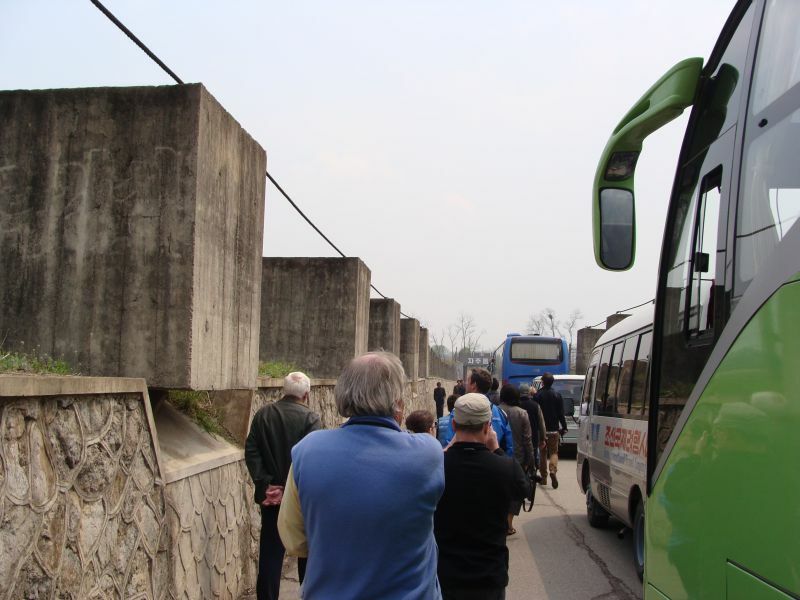 Then the buses advanced empty and we crossed inside the DMZ walking. Note more layers of defensive structures on the side of the road. This is the place where the 1953 armistice was signed. 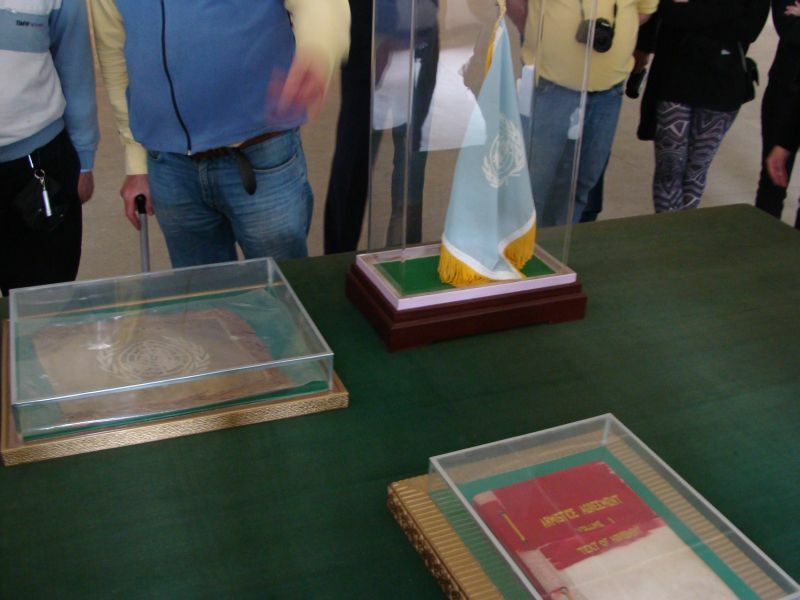 They said the old UN flag was original. Here you can see Laura scouting inside the enemy territory. 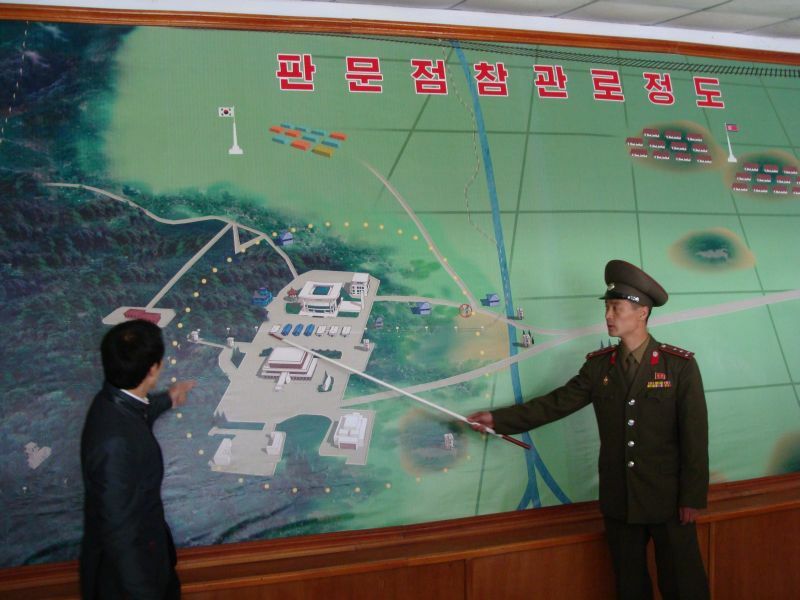 The silver and blue buildings are the joint area of command, with blue ones administered by the South and the silver ones by the North. 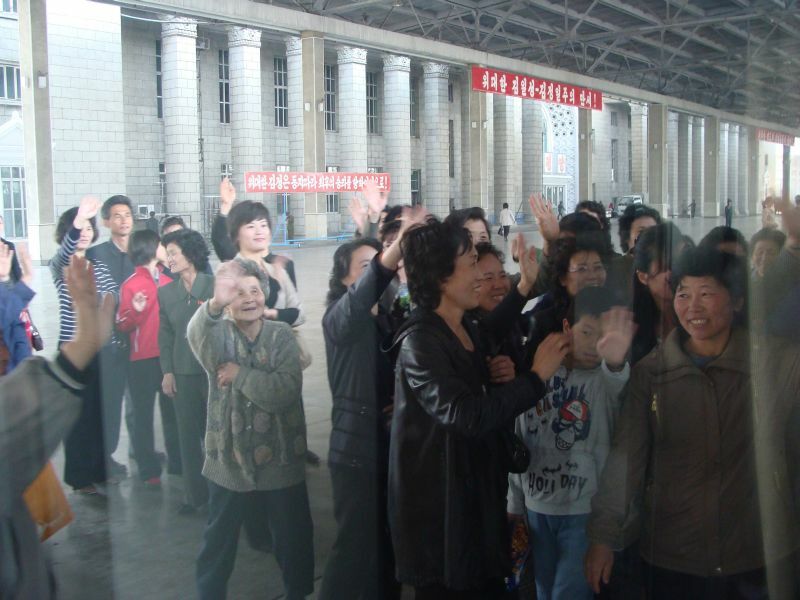 Previously, the tourists were allowed to go inside them, but due to recent tensions this part of visit was suspended. 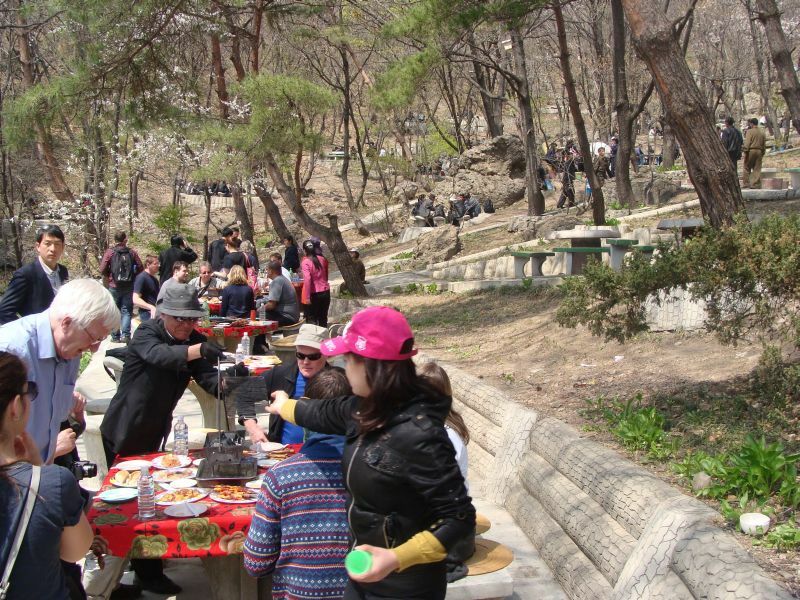 After leaving the joint area of command we moved to a different area of the DMZ, some 30km away, where we had another briefing. 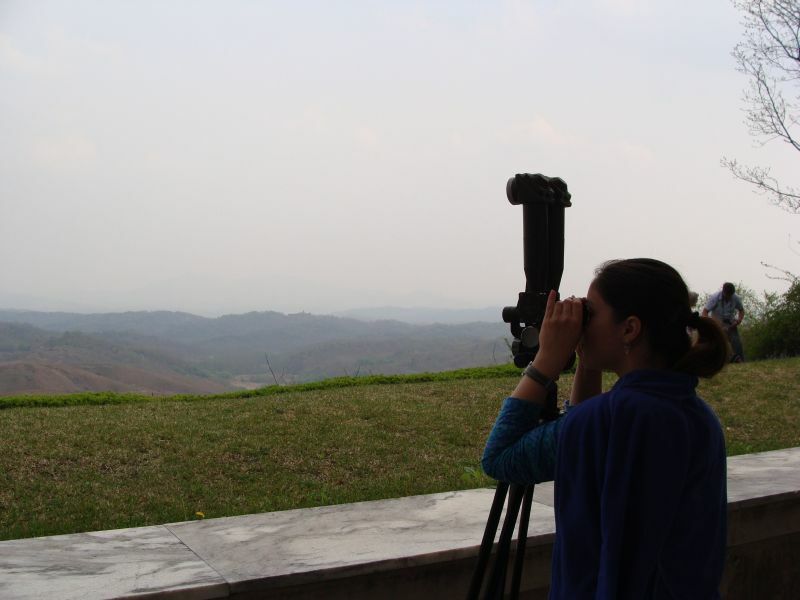 After the briefing we went to a military observation post to watch the opposing forces.